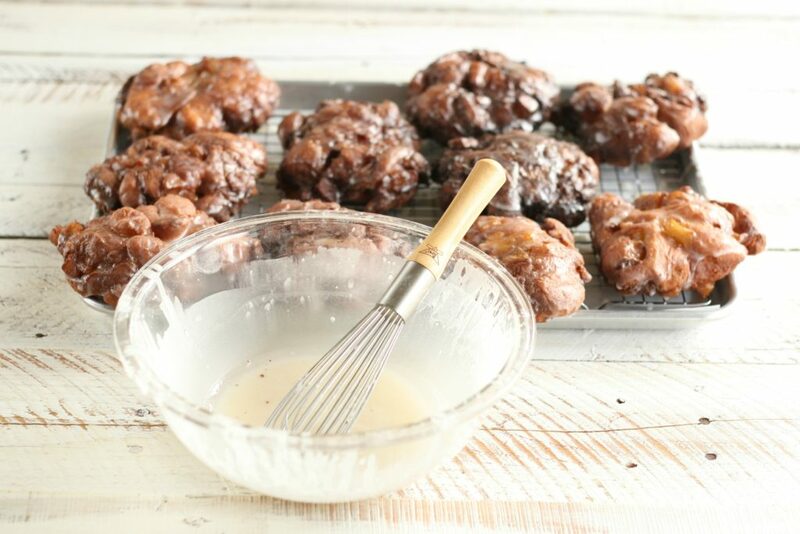 Make these delicious homemade Apple Fritters with glaze using simple ingredients. Some recipes you do the first time and they come out perfect. Others, you do, have a huge flop, give up on for a while, then tackle them again and get them perfect. This was one of those recipes. 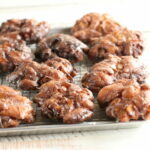 I worked on the recipe for these delicious apple fritters for a year. I just didn’t have the time to perfect it, at the time. It’s funny, because what I was trying to do was make a great doughnut recipe this time around. The thought of making apple fritters hadn’t even crossed my mind. But, I thought, I should make homemade apple filling and the rest sort of fell into place. Now, for the technique of how to assemble them, you’ve got to watch this video. This will help guide you on how to make them. (I don’t flatten them quite as much as this gentleman does) But you’ll get the idea. I make homemade apple filling. Super simple to make. I use a combination of Granny Smith and Braeburn apples. I’ve found this is a great combination. Granny Smith apples hold up a little better, while the Braeburn apples break down a bit. Which is wonderful, because the apple that breaks down, gives you the sauce. And the crisp apple stays whole, giving you something to chomp your teeth into. I’m thrilled this recipe came out so good! I really hope you enjoy! Hope you all had a wonderful Thanksgiving and are getting ready for the holidays! If you’re like me, and still have gifts to buy for the busy holiday season. Check out my latest cookbook, A Farmgirl’s Table on Amazon and in Barnes and Noble nationwide. Wishing you all a very Merry Christmas, Happy Holidays, and happy baking! Turn the dough out onto a floured work surface and knead for 5-6 minutes, making a smooth dough. This dough is going to be sticky when you turn it out. After kneading, shape into a round ball and place back into the greased mixing bowl. Cover loosely with plastic wrap and drape with a clean kitchen towel. Place in a warm area and let rise until doubled in size, about 1 hour. Turn the dough out onto a lightly floured work surface and knead the dough for a few minutes. Turn back into the greased bowl (spray with cooking spray again if needed) and let rise until doubled, about 1 hour. Turn the dough out onto a lightly floured work surface and roll out with a rolling pin. Making it into a rectangle shape, about 1/2-3/4-inch thick. Spread the apple filling evenly over the dough. Sprinkle generously with ground cinnamon. Sprinkle over that, generously with all-purpose flour. (about 1/2 cup or so). This will help absorb some of the moisture from the filling. Roll up, starting at the long end, like you would cinnamon rolls. Cut the dough on a diagonal, then back the other way. You want to end up with pieces about the size of a quarter. Gently push the pieces back into small patties (about 3-4 inches in diameter). You'll want to sprinkle the pieces with flour as you go. This will be a sticky mess. But well worth the time, effort and mess involved. Place the apple fritter patties on lined half sheet pans. (you should get about 3 rows of 3 on each sheet pan) Cover loosely with plastic wrap and refrigerate for 2-3 hours, or overnight. While they are in the fridge, whisk together your icing. Cover with plastic wrap and set aside. You want it to be fairly thin. While the oil heats up, let the trays of apple fritters warm up on your kitchen counter. Fry in 375 degree F canola oil. About 2-3 minutes per side. Flip carefully. Once fried, place them on a sheet pan lined with plenty of paper towels to absorb some of the excess oil. Let cool slightly before dipping only the tops in the icing. Let drip dry on a cooling rack, placed on a parchment lined half sheet pan. Once the icing is set, enjoy! These look unreal! 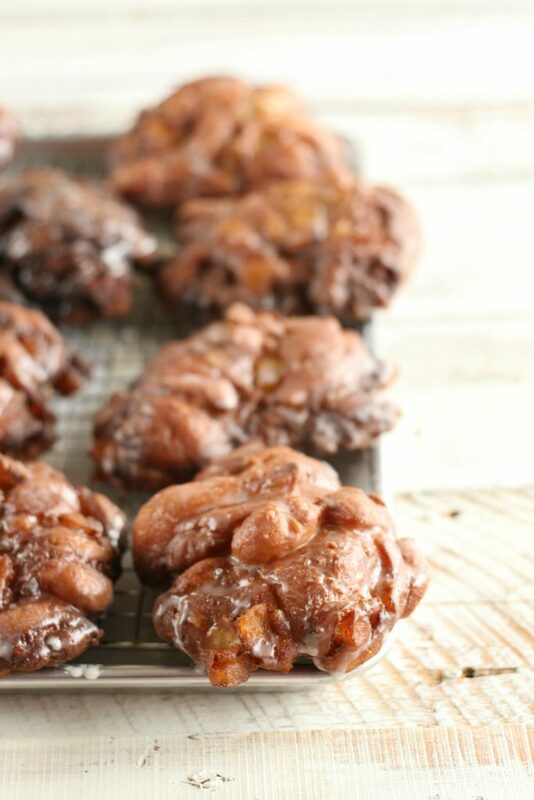 My husband loves apple fritters so I’m going to have to make these happen! I’m not sure that I’ve ever eaten an apple fritter! But they look delicious and sweet- I want a bite! Who needs to go to Tim Hortons when you can make these unreal apple fritters in your own home! These look absolutely delicious and I’m going to have to try these out on my family. Oh-oh! Now that I’ve seen your recipe, I can’t unsee it! I want to make these for New Years day!! I love apple fritters and these look perfect!! 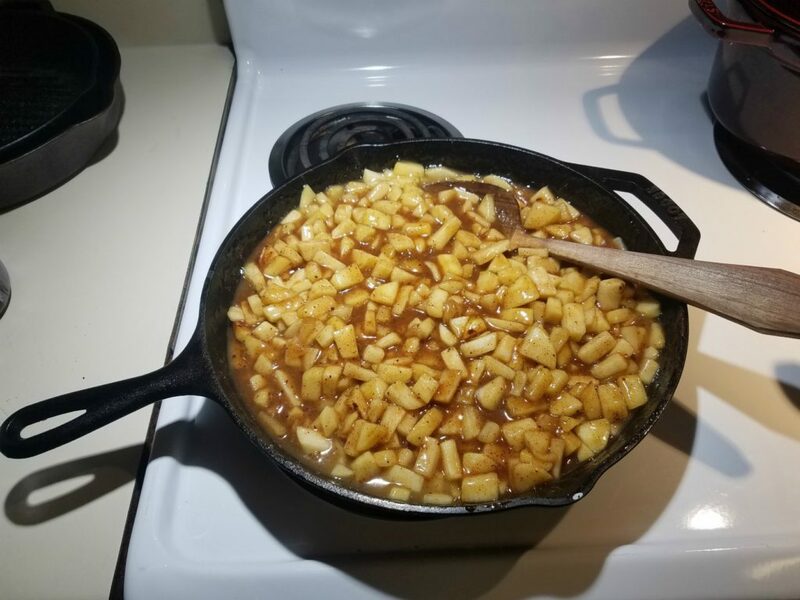 My sister loves apple fritters and luckily for me, and her!, she is currently visiting me for the holidays so I am going to make this recipe ASAP. I love apple fritters and any kind of apple dessert! These are a labor of love and meant to be shared! I need to take these to my office for the crew. Thanks for sharing. Your apple fritters look better than the bakery’s! I will have to try it with a gluten free flour. I bet they will be just as delicious. Those brownies look yummy, too! These looks totally addictive…and I know I would have a hard time eating only one. I love using Cortland apples for my recipes….but ALL are delicious. 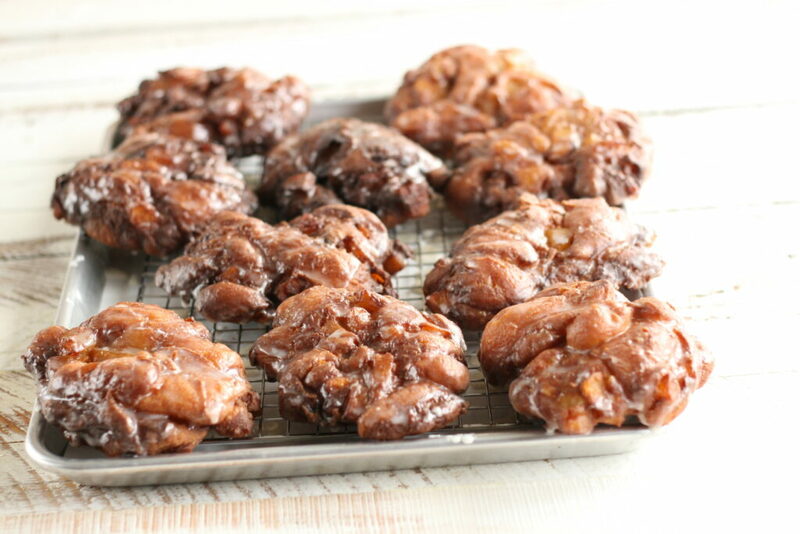 oh this Apple Fritters looks so delicious… wish I had some right now! The fritters wouldn’t last long at our house. I would enjoy some right now. Adding the homemade apple filling makes them super special. I’ll have to make some for our grandsons. These apple fritters look so delicious! What a nice end to a festive meal! Your apple fritters look like our beignets aux pommes which my mum used to make. In fact from the recipe ingredients list it looks like just the way she would make it. 🙂 You got me craving these babies now!! These are my favorite donut, I never thought to make them myself. They look amazing. I’m with you, skipping Black Friday was practically the first grown-up thing I did:) Happy New Year! Oooooh my goodness, these looks so incredibly rich and decadent! What a great treat for fall and winter. These look fantastic! What a fun weekend project this would be – and a delicious one, to boot! Looks so rich in flavors and delicious. Adding this to my list of must tries. Not sure I understand the cutting portion and patty portion……..want to try very much! You need to cut into small pieces and press back together. Watch the video to see how to do it!